Editor's note: China Daily's auto editor reflects on the remarkable events that have shaped the nation's car industry and markets since last year. China became the world's biggest auto producer and market last year, surpassing the United States, where auto sales plunged as a result of the global financial crisis. Vehicle production in China grew by 48.3 percent year-on-year to 13.79 million units in 2009 with sales jumping by 46.2 percent to 13.65 million vehicles. The strong performance was mainly boosted by robust vehicle demand in China augmented by government incentive policies. In January 2009, the sales tax on vehicles with an engine capacity of less than 1.6 liters was cut to 5 percent from 10 percent. The government also earmarked 5 billion yuan to subsidize rural buyers of mini buses and trucks during the period between March 1 and Dec 31. Today China's vehicle market is still on the fast track. In the first quarter of 2010 vehicle sales in the country soared by 72 percent to 4.61 million units from a year earlier. Although the pace is predicted to slow in the second half of this year when compared to the strong second half of last year, growth for all 2010 is projected to reach 15 to 20 percent. Governmental incentive policies remain in place with slight adjustments. The sales tax on vehicles with a displacement of less than 1.6 liters has been lifted to 7.5 percent this year, but still lower than 10 percent in 2008. In a first by a global auto giant's top executive, Toyota Motor Corp's President Akio Toyoda apologized to Chinese customers at an emergency press conference on March 1 in Beijing for its massive global recall over brake problems. In China Toyota recalled 75,500 units of its RAV4 SUV produced by its joint venture plant in Tianjin due to defective brake pedals, a tiny portion of its global recall of more than 8.5 million vehicles due to similar problems. "The incident caused worries to Chinese consumers. 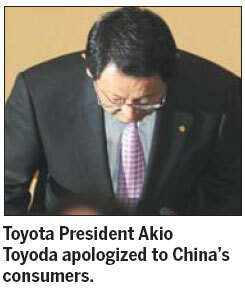 I hereby express my sincere apologies for these worries," Toyoda said at the press conference. He blamed the problems mainly on its recent overly rapid expansion. While he made a similar apology in Washington, the company faces far more serious sanctions in the US. According to China's current regulations, vehicle producers that try to cover up defective products can be fined a maximum of 300,000 yuan, a trivial punishment compared to what they face in Western markets. Toyota's sensational problem was also a big lesson for fast-growing Chinese carmakers that want to be globally competitive in the future. Toyota also announced a recall last August of more than 688,000 China-made cars due to an electric window problem, the biggest ever vehicle recall in the country. The recall affected Toyota's Camry, Yaris, Vios and Corolla models. 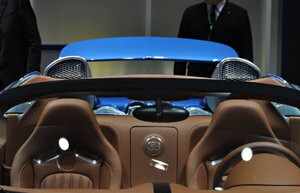 Luxury cars are presented at Beijing Auto Show. A PorscheBoxster Spyderdisplayed at the 2010 Beijing Auto Show. 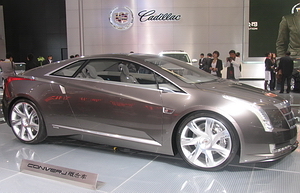 A Cadillac Converj concept car is displayed at Auto China 2010 in Beijing. Cadillac is one of GM Group's sub-brands. 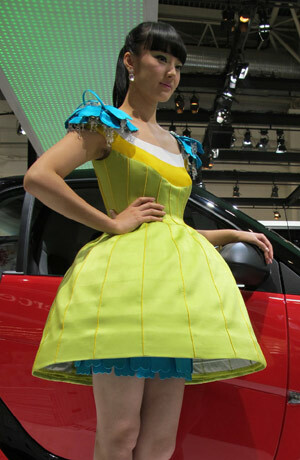 A GAIC Everus concept car displayed at Auto China 2010 in Beijing.